Christmas eve & day were filled to bursting with friends &/or family & food & (to quote my friend Cathy) "all that sugar cookie, candy cane, smeared with the glitter of the holidays stuff." We know how to have fun up here in the mountains, & I'm pretty sure there's not a more loving family on the planet. My goal was to spend Christmas day in my nightgown & (Vietnamese silk) robe & I far exceeded that. I almost made it 3 full days, but on the 27th my dad had the wood & coal stove stoked up real good. The silk robe was much too hot! So I slipped a sleeveless dress on over my nightgown. Does that count? A girl has to have goals, after all. I could go on & on about everything—feeding deer off the back deck, my folks & I meeting my ex-inlaws & my nieces from Australia for lunch, drawing with my sister's "grandchildren" (her ex-boyfriend's daughter's children) on Christmas morning, using expired Sponge Bob Deep Sea Bubble toothpaste (I think I'll throw it away when I leave—it's effectively childproof because you have to squeeze so hard to get it out, but I like it better than the tiny tube of crappy-tasting toothpaste I brought), dial-up e-mail, etcetera—but I won't. Speaking of dial-up, I am writing this in my word processor & then (I hope) importing it into Blogger. 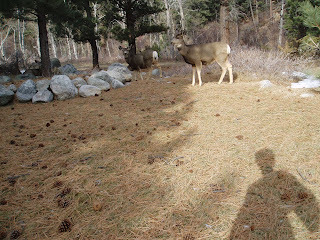 With a picture even, of my shadow & the deer I was feeding. If there's no picture, you'll know dial-up was too wimpy to handle it. My folks are out at a funeral. I went to one with them yesterday. There's a wedding this afternoon. I decided I could take one of each, but that was my limit. I have a big pan of very favorite beans simmering on the wood & coal stove, made with smoked turkey. Mom & I boiled up the carcass yesterday for stock & I picked the meat off the bones this morning. Should be delish. I hope all of you had fab holidays, too, & that the new year will bring more of the same. 110. Spend a day in your pajamas. 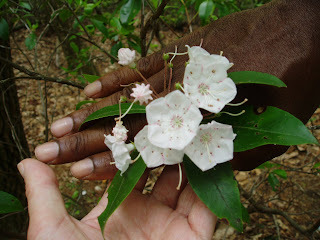 This is what mountain laurel looks like. It starts out as little stars & turns into bells. It's so beautiful--I can't imagine a better flower to be named after. In a few days I'm heading north for the winter--or for a couple weeks of it anyway. Weatherwise, it could be a mistake, but I'm sure the warm company will make up for the temperature. White Christmases are nice anyway, as long as they're not too white for flying & driving. I will not linger long here at this coffee shop. Perhaps I should call it a tea shop today, as that is what I am drinking. I took a big risk & ordered Earl Grey. On the risk scale, where 1 is getting out of bed & 100 is sky-diving into a hurricane, Earl Grey sounds like about a 4. But it was scary. well, on a risk scale of 1 to 100, the Earl Grey was about a 4. I like it, I really like it. (Earl Grey is a distant cousin of Sally Fields.) But I'm not going to buy a box or give it an Oscar. Yet. I'll flirt with it occasionally at coffee--err, tea shops. Lapsang Souchong will retain its favored flavor status in the harem of teas. But Earl Grey is dusting off its ascot & derby, thinking of the day--cheerio!--when it actually lives in my kitchen & can compete cuppa a cuppa with the upstart. A little bird told me--no, really! We shall continue beginning with a weather report: Asheville, which has been droughting, had misty fog last night. Today, there was freak--& highly localized--rain of capers. It appeared to be centered around my table at the coffee shop & may have had something to do with the lox & cream cheese bagel, which comes with lettuce & tomato & (hold the) onions & (?) capers. The National Weather Service & my barista are arguing about the cause. In the meantime, I have humbly picked up all straying capers & deposited them in the trash. I would have written before--through mist & drizzle & shower of capers--but the skittish herd of organic free-range wi-fi which has been scampering sporadically through my apartment appears to have been corralled & fitted with those bright orange radio tracking collars that the forest service puts on elk & bighorn sheep. Either that or someone has put invisible fence or an oil pipeline between me the wi-fis, disrupting their normal migration pattern. So, unless I traipse on out to a coffee shop, no wi-fi for me. Therefore & thus, my numbers for December are not looking good. T'is the thirteenth & I've posted but thrice before this. (A surfeit of "th"s you think? I thought that's what you thought.) Anyway, this is your warning. If I get close enough to twelve to poke it with a long stick, I'll count myself lucky. I'm still thinking about real estating. I considered making a re-offer on the place I already offered on, as it's still on the market. When I made my offer before, Labor Day weekend, it had been listed for a mere 3 weeks & the owners weren't nearly hungry enough. Now--perhaps. So I thought about it, but then I saw another house that was a possibility & thought about that &--well, I guess it's not a "Hell, yes," if you have to talk yourself into it or you can talk yourself out of it. Plus, taking off for the holidays is not conducive to real estating. Besides, a little bird told me to wait. Actually, a little bird told me to go for a walk, which then led me to a gallery, where I looked at cool paintings & talked to the gallery owner a bit. Then I left & thought, well, maybe the little bird (An actual little bird, btw, which hopped near me when I was going to get in my car & seemed to convey--silently, with its little bird eyes--that I should walk NOW. So walk I did, to the post office & there it was again, or perhaps its cousin.) wanted me to do more than look at art there, so I went back in & said to the owner, "This might sound a little strange, but I'm thinking about acquiring a house & I wondered if you knew of any." She gave me the funniest look & said, "How did you know I'm a house guru? If I wasn't an art dealer, I'd be a real estate agent." So she gave me some advice about the market getting even better for buyers next year & said she'd keep her eyes open for me. I even told her about the little bird, which really made her laugh. 108. Pay extra close attention to your hunches today. Actively seek out a hunch on a subject. ("Where should I go for lunch?" perhaps.) Look for & listen to the little birds. I am making a duck, I think, & thinking about acquiring a new computer. Anyway, I am not getting a new computer tonight, so if you don't get this message, or if the picture is missing, you can blame the old computer. Or me. Or anyone you want to blame. Except the duck. Do not blame the duck. You know what this is? this is part of the space that the picture was supposed to be in. I give up. The computer keeps resetting & doing stupid stuff while it's supposed to be looking for the picture. So, no picture. & man, it was really cool, too. I hope the post posts. Ooh! I almost forgot: I bought a world map today at a little map store in Black Mountain, which was supposed to have closed 15 minutes before I arrived but did not in fact do so. It's a Buckminster Fuller projection--also known as the Dymaxion projection--& is way cool. I've been wanting one. It doesn't distort the shapes or sizes of the continents. 107. Look at a map of the world--Dymaxion, if you can get it--& pick a spot to shower some extra-special attention on. I was all set to write my blog & then I couldn't think of anything to blog about & then I thought I'd do a photo instead & then I started looking at my photos &--well, this is just to tell you I'm not really blogging today. & I couldn't really decide which picture to put in, so ignore this one, from July 2006 in Racine, Wisconsin. If I was going to put a quote from The Art Spirit, it would be Real students go out of the beaten paths, whether beaten by themselves or by others, and have adventures with the unknown. However, since I'm not really blogging I won't do that. 106. Pick something not to do & don't do it. It's officially winter now, according to Laurel. December, January & February are winter. March, April & May are spring. June, July, August--summer. I'll let you guess what the fall months are. Anyway, happy winter from Winter. The weather is beautiful, crisp & sunny with some clouds in the forecast. I hope it rains. The mountains would enjoy sipping some precip. My friend Bill has informed me that it is time to start adding photos to the blog. (You remember Bill--he's the one who informed me I was about to start blogging.) He told me it was easy as pie & he'd tell me how. I have decided not to techno-damsel. I'm about to try doing it myself. Oh! It worked. (Don't sound so surprised, goddess previously known as techno-damsel.) 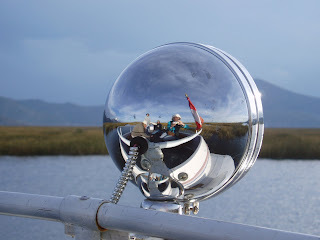 That is a self-portrait reflection from a boat on Lake Titicaca in 2004, early February. I was thinking of Peru today, because I am sponsoring a Peruvian boy's education--I met him in the jungle there in 2004; he was 5, & already working at a 2nd grade level--& I just got a little update from Dolly, who led our tour down there & set up the sponsorship program. So here's to dear, brilliant Jefferson. The best art the world has ever had is but the impress left by men who have thought less of making great art than of living full and completely with all their faculties in the enjoyment of full play. From these the result is inevitable. 105. Look at some photographs you took--or some that were taken of you. Cool. 11 posts in the 11th month. Maybe I'll do 12 in December. January's looking grim though. Grin. I write you from the semi-satiated space between 2 cream cheese bagel halves. (As in, I have eaten the first half.) Here in this space there is some relief from hunger, but it is not good for ones clothing to stand too close to the event horizon of the second half, which is sucking me inexorably into the cream-cheesy goodness. Aaaah, my new plum organic cotton hooded wrap jacket, noooooo! I must eat my way out of this chasm before I can finish this post. One moment. Talk amongst yourcyberselves. Much better. You ever have one of those days when you realize the only thing you've eaten is a piece of toast with butter & pear preserves & a couple clementines? I don't know how much of the day I spent on the phone, but it was a fair percentage. The good news is that it was all fun & pleasant & I now have travel plans for the holidays & numerous persons who would be interested in said plans notified. Montana, via Minnesota. I thought I had everything set up to just fly to Billings with my Capital One miles, because I have more than enough. Except there's also a $ restriction, as in up to $500, which doesn't even come close to covering Asheville to Billings, Montana, during the holiday season. So I'll fly to Minneapolis instead, rent or borrow a car, drive to Montana, hang out with the friends & fam, drive back to Minnesota, hang out with the friends & fam (the latter being my son & his fiancee) & then fly back. Heck, it's only a 12 or 13 hour drive. One way. Grin. You will be so proud of me. (I'm talking to you, Cathy.) I just mailed a bunch of stuff at the post office, including 3 short-short stories for a contest. The deadline is not until Monday the 3rd of December & I--she said, patting herself on the shoulder--have mine sent out while it is still November. Yay me. Okay, so it's the very lastest of November, but still. & now it is time to finish my coffee & walk home & do a couple more things to prepare for her arrival. But first, your quote from The Art Spirit by Robert Henri. Today must not be the souvenir of yesterday, and so the struggle is everlasting. Who am I today? What shall I see today? How shall I use what I know, and how shall I avoid being victim of what I know? Life is not repetition. This parcel was fortuitous, because I walked out a tiny bit underdressed for the day, considering sundown & all, for it contains a plum organic cotton wrap jacket with a hood. It ties around the waist & has a little flare skirt. (I think I was a figure skater in a past life; I just love their costumes. Or, considering my figure skating ability, perhaps I was a figure skating costume designer. Grin.) So now I will have 2 layers for my return walk. I may be able to get the other items in my canvas bag & be able to go boxless for the mile walk home. That would be nice. Time to do something other than blogging before I begin the trek back. 103. Think about your own individual judgment & taste. Are you expressing it? Do you think Picasso started with fingerpaints? You may not be excited, but I am--this post gets me back up to June & July production levels. & I would say there is an excellent chance it will not be the last for lovely November. It is beginning to feel on the verge of winter-ish here. But, winter-ish here & winter-ish in all the other wheres I have lived is a vastly different thing. Plus, it is still just on the verge. It was cool on Saturday, but this week the highs are supposed to be around 60. It flits in & out. Last year it was 70 on New Years Day. Went to the co-op for supper & shopping. Almost walked out without the oats, so I actually went through check-out twice. I made oatmeal in my new double boiler & it was so perfect. A friend came over for breakfast a couple days ago & he said it was the best oatmeal he'd had in 10 years! I didn't have enough oats left to make a decent batch--the first purchase was trial-sized. I actually got the little bag of oats a few days before I could make them, because I didn't have a proper pan. Little tiny saucepans & one great soup pot, which still had leftover very favorite beans in it. So, a double boiler. A wise acquisition. Also recently acquired is a 5-foot folding table, which is currently set up in my studio space. Much nicer for doing projects than the kitchen table, which can now be more easily used for its intended purposes: eating & playing cards. Something I bought a while ago & haven't used yet: fingerpaints. I'll keep you posted. 102. Get some fingerpaints. Pretend you're 5--& try to paint as if you don't know you're the one who has to do the clean-up. The above has no errors in date recognition, spacing or capitalization. I know that today is Friday, the 23rd day of November--which is why I am NOT out shopping. I know that there was a big holiday yesterday, that is compound-worded & capitalized. I'm just capitalizing on the everyday opportunity of ecstatic gratitude. It was all so lovely, & with lovely people. Today I finished off the very favorite beans. I'll roast up a small turkey one of these days--with an eye to soup!--but it's quite nice to be less stuffed than a traditional Thanksgiving turkey. I established the kipper snacks & clementines tradition last Thanksgiving. The cold cereal was new for this year. It cracks me up to specifically plan on cold cereal--I did get 2 kinds of milk, so I'd have a choice. What a feast!--for one of the biggest eatin' days of the year. This is it, the big moment. Blog alternative is about to turn 100. But, I suppose, first there must be that little matter of the post. & indeed I have something to post about! I sold a story to The Magazine of Fantasy & Science Fiction. Okay, that was the post. Now for the real important part, the Blog alternative. For those newer readers, who haven't been in for the long haul, I'll fill you in--or simply refer you back to Wednesday, April 18th, 2007, when my entire post consisted of 27 things to do rather than reading blogs. Since then, with more or less consistency, I've put a similar suggestion (sometimes 2!) at the end of each post. I will admit to a bit of performance anxiety. 100. Ooh, gotta be a good one. Hmmm, I wonder what I'll suggest. What if it's not worthy? Oh come on, it's just an idea, silly girl. How many people are doing any of these anyway. Heck, you don't even do most of them. (Hey, I do some, sometimes.) Still, though, whatever. 100. Write a list of 100 somethings. 100 things you like best about yourself. Dear Imaginary Student. Two words: Be plastic. I just got an email from one of my high school classmates, whose friend's daughter is going to attend Montana State University in Bozeman, come fall 2008. She wanted the scoop & so queried some of us who had attended there. I thought I'd share my response with you. I will dedicate this post to my college roommate, Peggy, who died of cancer shortly before the 30-year class reunion. Well, my information is mostly 30 years old. Grin. I loved the campus. Piece-of-pie-shaped dorm rooms in Roskie. Yay. Cheesesteak sandwiches at the Pickle Barrel. Karl Marx Pizza (of course, I don't know if K.M. still exists...) Bozeman Hot Springs. Museum of the Rockies. The historic Ellen Theater downtown. Make sure you play lots of frisbee football & get up in middle of the night to make popcorn for a desperate architecture student (r.i.p. dear Peggy) & go see strange foreign films. Take classes that have nothing to do with your major. Submit something to the college literary magazine (is it still called Jabberwocky?) or at least read it. Listen to KGLT (the campus radio station, if I'm recalling the letters correctly). Love yourself. Smile every time you see yourself in a mirror, as if you'd suddenly seen your best friend. (Because, of course, you have!) Remember that your purpose in life is to be happy. Write to me if you need a sudden squirt of positivity from a total stranger. I checked out some property on Sunday: low-cost rental property that's being converted into really affordable condos. I'll cogitate on that for a while. Definitely still a buyer's market here. I might even get a chunk of land & put up a duplex for starters. So many options! 99. Look up the word plastic in the dictionary & be plastic for a day, with whichever definition suits your fancy. Oooh! Get ready. Next post, Blog alternative turns 100! "My great-uncle was eaten by cannibals." As lovely as the trip was, I am happy to be back. On Thursday Nick & I had Cheerios for breakfast--they get giant boxes of cereal to be thrifty--since neither of us was feeling ambitious. (Besides, Cheerios sounded good.) Wednesday night I took him & his roomies out for Mexican food. That's what parents do when they visit, if they're following the parental protocol handbook. I can't remember the last time I laughed so hard. Anyway, after breakfast Nick backed up my files on some stray space on one of his hard drives so I have up-to-date off-site archiving. & then I was off into the wild blue (actually more wild yellow & orange & red, given the leaf state) yonder. I drove through some little towns & such rather than getting on the interstate right away. Best business name, Furbank, a pet-grooming salon in a town called Burbank. That reminds me of something I forgot to tell you. Best quote from the convention: "My great-uncle was eaten by cannibals." The whole trip (made just a bit longer by my lost-ed-ness near the Cleveland Browns stadium) was 1945.9 miles. I haven't cleaned out the car yet, which it desperately needs, especially after I picked up the Pringles can--& not the Pringles. It was upside down & the lid came off. I got most of them back in & devoured them later, but there are still crumbs. My fortune was fun. See the blog alternative, as I am planning to share it with you. You lucky people get a fortune without the nasty little cookie! Coffeeshopping in Oberlin Oh! I decided to purchase rather than windowshop. One latte & potato chips, lightly salted. Much fun with Nick & his roomies. They are interesting individuals. I come away inspired every time I see them. Getting here was a trip, though. Left Syracuse after 2 pm, thinking to be in Oberlin in about 6 hours. Not. Snow slowed things down between Syracuse & Buffalo. There wasn't a lot of it, but it's early in the season & people aren't used to it yet--& some people never get used to it. I think I was driving behind a couple of them for a while. It's one of those cases where it's hard to decide: do I pass, which involves moving through the slushy ruts with great care or follow someone who's going 20 miles an hour slower than I need to go & isn't confident anyway? I passed. Then Buffalo was stop & go & stop again all the way past. Then there was road construction. Then I got lost in Cleveland. (So far, on the list of places that make my heart sing, Buffalo & Cleveland aren't it.) Fortunately Bruce got home & got my message & google-mapped me through it. What a nice exhusband! I didn't adopt a pet truck. One followed me for a while, as if auditioning for the job, but no. Then there was one that I was kinda sorta following, but its aesthetics weren't good & it wasn't a proper truck, but rather a rental truck pulling a car & it didn't have the steady & sure characteristics that I like in a pet truck. I might get one on the way home. But, I finally arrived at Nick's abode. We sat up & visited & I drank tea & then slept well. He made us pancakes for breakfast: he can flip 2 at a time. Mostly. When he made little teeny ones with the last of the batter, he did not successfully flip 5 at a time. But the floor was clean. Grin. He populates his pancakes with chocolate chips. I'm more of a pancake purist myself. Sometimes blueberries. I did put peanut butter on mine though. So now I'm sitting in a coffee shop called Recess kinda near Bruce & Helen's, working on a novel. I went into the restroom & they have this cross-stitched sampler that says Have a Nice Poop. So I couldn't resist. Two posts in one day. Ah well, you might survive the shock. 95. Have a nice poop. I'm sitting on a rocking chair, next to the big Russian bear on the floor in the corner. (Don't worry, he looks well-fed.) Bruce & Helen are IBMing & studying for boards, respectively. We had a lovely supper last night after I arrived from Saratoga Springs. (Or Sartog, as my friend Cathy, the Seattlite, ex-New Yorker puts it.) (Actually, I'm not sure people actually become EX New Yorkers.) Visited. Walked to a coffee shop in a little rain. This morning we had crepes & steel cut oatmeal. Delish. Okay, so I want this to be more than a food report, so I will talk about trucks. I had a pet truck for a while last Thursday. Shiny & swift & unswervable, the kind of truck you can pass without worrying that it's going to creep into--or even toward--your lane. We leapfrogged a little. Sometimes I would lead the truck & sometimes I would let it forge on ahead, as long as it stayed within sight. Then there was traffic congestion & I was afraid I was going to lose my little truck (little is a term of endearment, rather than a descriptor) but I did not. With a bit of judicious passing, I was able to reconnect & we traveled happily together for some miles. Yet, I know the way of pet trucks. One must not hold too tightly. One must allow them to find their own paths, or, better yet, their own highways. (Trucks are hell on paths.) I don't remember when it actually split off from my route, but I remember the little catch in my throat as it signaled--it always signaled!--& smoothly merged onto another road. Goodbye, my friend, I murmured. Safe travels. & then it was gone. Bruce & Helen & I are going to do our morning tasks & then go look around Syracuse a little. Helen works at the hospital here (she's an epileptologist). They've got a lovely apartment, filled with light. Nice hardwood floors. A couple sometimes barky chi-hooah-hooahs (that's how they're pronouncing it for fun) downstairs. Later today or tomorrow I'm going to go see Nick. 94. The next time you're driving, keep your eyes open for a pet truck. Hang with it for a while. Even name it if you want. Then, let it go on its way. On Thursday, I was in 4 different states in my first hour of travel: Virginia, West Virginia, Maryland & Pennsylvania. By the end of the day, I'd added New Jersey & New York. For a Montana girl, that just seems crazy--Montana alone is a good day's drive & all the states around it are pretty decent-sized, unless you cross over that bit of Idaho. So, 6 states in a day--& if I'd started earlier & wanted to drive longer I could have done the whole trip in a day, which would have added North Carolina & Tennessee to the mix--is pretty amazing. You have to be doing a heck of a lot of driving to get 6 or 8 states, where I come from. Or, where I came from. Right now I'm very happy coming from North Carolina! I stopped in Bethel for car snacks--to my leftovers I added green apple white tea Snapple & a Reeses peanut butter cup. I'm noticing a trend on this trip: white tea & junk food. Saratoga Springs is a great town. Vibrant downtown with lots of shops (one said "office supplies & hats" which certainly attracted me. I bought a little suede beret.) & tons of restaurants. I just got back from a crepe restaurant with my roomies & a couple other friends. WFC is a great con, although this one has an inadequate bar. That's really the best place for the editors & agents & writers & artists to do business. I did talk to Jane Yolen & she steered me to a new agent, so that may be in the works. Also, one novel is confirmedly in the hands of another editor & another editor is expected to be heard from in a couple of weeks (alas, work avalanched her & she couldn't tell me by this weekend, but that's okay) & Suzuki England has indeed flown over the airwaves into yet a third editor's camp. Plus a friend of mine who's a great book doctor gave me great insight on another novel, The Song of Lizzie Whispers, which makes me excited to take another crack at that. It shall be interesting. So many great people here--& I got a call from an uncle from Billings, Montana, who is going to be in Charlotte of a week while I'm in New York & Ohio. I might be back in time to catch him. Hope so! 93. Wrap something in something & eat it. I'm thinking lefsa or crepes or tortillas, although you could use a lettuce or cabbage leaf. Last week, when I bought the toaster, I also bought a little coffeemaker, the four-cup size. Not only that, but also this truly nifty ground coffee dispenser. You squeeze a button on the handle & it dispenses exactly a tablespoon--kachung--in the basket of your coffeemaker. It isn't picky though, & would dispense coffee on your floor or in your bathtub or wherever else you decided to squeeze the handle. So far I have opted for the basket of my coffeemaker. I just walked back from Malaprop's. Yet another reading/signing. This was Bud Harris, a Jungian analyst who has several books published. The newest is The Fire and the Rose, about spirituality & sexuality. I bought that & another called Sacred Selfishness. I gave a speech at a Toastmaster's speech contest once called "In Defense of Selfishness." It was perfect; I got second place, which meant a nice little plaque (I use it for a coaster now) & no need to practice the speech again & go on the next contest. I told my friend Cathy this, when she was about to participate in her first speech contest. Unlike me, she joined Toastmasters because she was already good at public speaking & enjoyed it & wanted to further develop her talents. I joined because my voice shook in front of the best audience in the world: 3rd graders. Anyway, I improved enough to get at least second place in a speech contest. The morning after Cathy's contest she called to tell me her results. "Did you get a coaster?" I asked. She replied that it's hard to set a cup of coffee on a trophy. She won! Yay Cathy. She & I both spent more time Getting Things Done today. I threw out some old index cards from 1987 & such that showed where various (mostly not-so-very-good) stories & poems had been rejected. I did keep the ones (a nice stack, if I do say so myself) that showed acceptances. Okay, so more Things to Get Done. Remember, I'm only blogging to get my numbers up. Grin. Tomorrow I can start with the sheer joy of blogging again. 85. Be selfish. Think of something that you want to do. You. Not someone else. Want. Not ought to or should. Want. Then do it! I am writing this blog tonight for other than the sheer love of blogging. I want to reverse the slow, steady decline of posts-per-month, or ppm, as we fondly call them. Anyway, you don't have to read this, since it's strictly an exercise in getting one more post out there. I worked on Getting Things Done today. Wrote a letter to my friend Maxine. I know, Bill, you're screaming, if only silently, Maxine? Who have you been owing a letter to for, oh, eons? My name's not Maxine. I know, Bill. But you are not 92, as is Maxine, so she got her letter first. Is it any consolation to know that I then put pen to paper on your behalf & your letter almost exists. Perhaps I should say partially exists instead. Anyway, it has been begun. (Now there's some messed up time sense in that last sentence...) You'll have to forgive me for writing a boringly normal letter, but I still have all that sand from Nags Head, so you could be in peril yet. I ate supper at the Grove Park Inn, at one of the more moderately priced restaurants, the Blue Ridge Dining Room. The Grove Park Inn is a VERY swanky hotel, so more moderately priced does not mean moderately priced. I had an appetizer & iced tea & it was over $20. It was super delish--shrimp & grits with gravy. Ummm. Watched the sun set behind the mountains. Or, to be more astronomically correct: watched the mountains rise to obscure the sun. Grin. To continue with a food report: For breakfast I had toast & peanut butter. For lunch I had toast & cheese. Did I mention I bought a toaster this week? Toasters toast so much better than combination microwave/broiler/ovens do. I guess that's why they call them toasters. Okay, I think this counts as a post. Yesterday I had a painting partner at a coffee shop in Hendersonville. I was going to go for a walk but it was a little warm (meaning upper 80s!) so I decided to coffee shop it instead. Had to put on long sleeves to survive the airconditioning. Go figure. Now it's bed time. Goodnight everyone. Or good morning or afternoon if that's when you're reading this. Happy insomnia? Merry coffee break? Grin. I don't have a calendar. I toyed with the idea of getting one when I started Getting Things Done, but decided no. After all, I have a refrigerator. Why would I need a calendar? I write what I need to do, along with day & date & time, on a pink, heart-shaped sticky note & put it on the front of the fridge. My cell phone & my computer tell me what day it is, if I choose to notice. Most of what I do is not very time specific, so I don't have to notice all that often. But if I have an appointment for acupuncture (& if you live in or near Asheville, North Carolina, & want to try it out, I cannot recommend Eli at Mystic Journeys highly enough!) or a haircut (ditto with Casey at Dang Salon) there's my little heartfelt (& shaped) reminder. It's a good system, fairly recently adopted. I was reminded of this yesterday, when I had my replacement haircut. I lost the little card that told me when my haircut was scheduled, & missed it & had to reschedule. With the new system in place, I was there at Dang, with the dashing cape around my shoulders, ready to be shampooed, when another woman came in, thinking she had Thursday at 11. She'd miswritten her appointment & had actually just missed her 10 o'clock. Casey asked if she could come back at 7 & she regretfully said no, she couldn't. So I offered to give her my time & come back later myself. (Ah, the benefits of a flexible schedule, that you can offer this largesse occasionally.) She was extremely grateful. So I went back to Casey at 7 & got my haircut. Scheduled the next one & wrote it down in a notebook. As soon as I'm done posting this, I'll transpose it to a pink sticky-heart & put it on the fridge. I told Casey about my calendarless-system & she said she used a planner that she never had with her when she needed it. I told her I always knew where my refrigerator was, & if somehow I misplaced it I'd have bigger problems than missing out on a few scheduled items. She said, yeah, she did know where her fridge was. Really interesting & well-written, even though they go into pretty excruciating detail on lots of psychology experiments. Neurophysiology & psychology & philosophy & Buddhism & quantum physics--all the good stuff. Now I have at least some understanding of quantum superposition & the physics behind why thoughts become things & the power of deliberate intention. In my dream, there were all these neighborhood dogs coming into my house, which I then had to let out so they could go home. It turned out there was an underground passage that I couldn't close off. Weird. No, I am NOT thinking of getting a dog. Still thinking about getting a house. Stuff percolating that has required some sleuthing. Something may or may not come out of it in terms of physical real estate, but my mental & spiritual real estate has already expanded just in the learning process, so I consider all the steps part of a WIN WIN WIN (& on & on) process. I'm sitting in a coffee shop. (What a surprise, I know.) This morning I was really tired & slept in--hence the dog dream--& after I got up was trying to figure out what to do. Started a pot of Very Favorite Beans (navy bean & ham soup, for those not in the know) & then tried to figure out what got me excited in the way of projects. I'm still emptying the In box in the Getting Things Done process, but I didn't want to just jump into that. So I started a painting: spread some gesso over an old painting. In the wet gesso I wrote--one big letter at a time--I used to believe in lack & limitation, but no more. 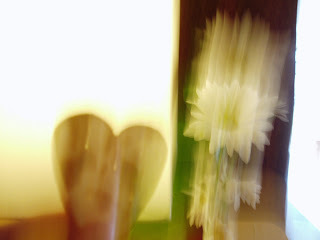 Now I know affluence & joy & love. Then I signed my name, again a letter at a time, & sorta smoothed over it with a palette knife. So, to those not in the know, it looks like a textured white background, but you know that there's a powerful message on that canvas already, before any line or shape or color has been applied! Time to meditate & drink my coffee & walk home. The gesso should be dry now. Who knows what the painting will be. 81. Cook (or assemble, if it's something like celery with peanut butter) an old favorite comfort food. which has been transformed into a giant "inbox"
just went back to Staples for my second box of manila folders. After working on the inbox (aka, the living room) on Saturday, I went to a pizza/movie with a new friend for her birthday (there were 3 of us & we had a blast) She's psychic--she held onto my glasses & told me a number of things, including that I have a red couch & a massage table (neither of which she had any way of knowing). my friends Charles deLint & Charles Vess will be there, as well as the fabulous Karen Schaffer, who is (thank you thank you thank you) responsible for my Ashevillean existence. Whilst the blog languished, the Laurel did not. Since Friday August the 24th, I have had many wonderful happenings, some of which (those that I remember) I will share with you now. I started looking at houses. Saw a listing for one that had two houses and another building on the lot, which would have gotten me started right away on my plans to become a land baron(ess). After talking to the guy on the phone, I got the idea that this one wouldn't be quite my house, but I also felt a twinge of intuition that by going to see it I would find my house. Turned out to be a really cool property, with potential to build. So I got info from the realtor & made an appointment to see it, with a savvy friend who knows about building. He gave it the thumbs-up & I got myself pre-approved for a loan at my bank on my way home. That meant another visit to the realtor to put an offer in, which required lots of signaturing & initialling of pages. Then it was in their court. Curious as to how it came out? I counter counter counter countered. I counter counter counter counter countered. They soulsearched & respectfully said that the previous was their rockbottom price. I respectfully declined to pay it. In the meantime, I live in a gorgeous (cheap!) apartment that I love & am not desperate to move. I can keep looking, at my leisure. I've read several great books since last I posted. The Path of the Dreamhealer, by Adam, which has so much great information for everyone interested in healing themselves or others--or just being happy. The Master Key System, by Charles Haanel. This is a FASCINATING book. It was published in book form in 1912, after being a correspondence course. You would not be able to tell by the language or the concepts that it originated at that time. For example, if you get the book--Barnes & Noble re-issued it--look at page 136, section 10. If you get the .pdf from somewhere--it's in public domain, after all--search for "cellular telephones." Remember, this is from the very early 1900s... I think you don't have to work quite as hard as he suggests to get what you want, but it's amazing work, & very clear. Getting Things Done, by David Allen. My son Nick recommended this to me. I think he just read the Wikipedia article, but his mama went out & bought the book. Even though it's very corporate-culture business-y, I think the concepts & practices will be very useful to me. I've scheduled Thursday & Friday this week to get everything in my "inbox" & getting "in" to "empty." I'll let you know how that goes. Nick is way ahead of me--not 22 yet & already getting things done. Grin. Tonight I get to see Diana Gabaldon at Malaprop's. A thousand years ago, when email addresses were just numbers, we were on the Litforum on Compuserve together, when she sold Outlander. I guess this is enough of a catch-up. Maybe I'll tell you about some dvds I've seen recently in the next blog or two. 79. Sit down in a quiet (or noisy, if it doesn't make any difference to you) room & pretend/imagine/remember/know that you are part of the infinite river of light, love, perfect abundance, perfect knowing, etcetera. Feel it flow through you. Let it bring things in & wash things away. Repeat as desired. I thinned out my collection a bit & got $26.25 from a local used book store. There are still books I am willing to release into the world, so that will be nice. I've been writing more, walking less, painting less and meditating more than usual. Reading more. Talking on the phone a little bit more. Watching dvds more. Blogging less. Seems like a good balance. I'm guessing the blogging will pick up again. And the walking! I wonder what the thunder is applauding so enthusiastically. 78. Go through your books & take a few (or a flurry) to a used book store. I am at the beach. Nag's Head, North Carolina. Last night I walked in the ocean with Cathy & this morning I walked in the ocean by myself, Cathy not being a morning girl. I should say Cathy's not being morning girls rather, as I think of my 2 roommates, both sound asleep at 9:57 a.m. This is a big house on the beach, because there are many families & all ages. (The youngest is a year old.) I was going to be on one of the couches downstairs, but Cathy & Cathy took a look at their bed & we decided I could just stay with them. So it was a Laurie sandwich. Plenty of room for the 3 of us. I was tired, having popped up 3 or 4 times in the middle of the night before last to write. Words & phrases were buzzing in my mind, & they were too good to let go. So I got up &amp; wrote & then went back to bed & the words kept at it so I got up again. A couple times. It was great. However, add that to a 7-hour drive to the beach &, well, I was tired. But the beach this morning called me. Not being much of a sunbunny, I wore a long skirt over my bikini bottoms, & a shirt rather than my bikini top. Plus another shirt over that, with sleeves. Also a floppy hat once worn on a trip to Australia. When I was walking in the edge of the waves however, I did tuck my skirt all the way up so it wouldn't get wet. Before I went out, one of the women was commenting on the heat, as she headed out into the screened porch to smoke. "I don't like the heat," she said, clearly preferring to stay in where it was airconditioned, "but I'm a smoker." That made me think about how we define ourselves. There's a difference between saying I am a smoker & I smoke sometimes. I don't care how many packs a day you smoke--there are times when you aren't. I believe--I don't know for sure, but I bet I'm right--that saying I smoke sometimes gives the cigarettes less power than saying I'm a smoker or even than saying I smoke. If you add that sometimes, it can't help but remind you of all the times you don't smoke during the day. I was thinking about all the other things we say we are, too. What's my litany? I am a writer. I am an artist. I am a healer. I am a mom. Aside from I am a mom, none of things are what I am all the time. They are things I do sometimes. I think I'm going to experiment with just being whoever it is I am, & not defining myself with the things I do sometimes. It will be interesting to see how it feels to not introduce myself without saying "I am a writer." Oh, the sand & the shells & the little fishes & the hopeful surfers lurking & waves retreating & advancing, flirting with my feet. Crab exoskeletons. Abandoned sand castles. Sun & wind & the geometry of piers. Shore birds skittering. Laptop battery power down to 21 percent--oops, time to post & visit with the Cathy's, who are now arisen. Also going to try sudoku with one of the little boys, who is a math whiz. And joyfully, we danced on the roof of the truck! my executive assistant & I came to the coffee shop to do email & such on our way to see her new apartment, which isn't far from mine. She's looking for a car, so I called my car-boy Zach & he told us to check autotrader.com & while she was doing that & I was re-reading The Tipping Point by Malcolm Gladwell, we got sucked into watching 2 back-to-back episodes of Law & Order. (I'm SO glad my tv isn't hooked up to anything but the dvd player...) It was really fun, like a movie night out, & we were happy to have done it & happy we don't choose to do it more often. But, the big benefit is that it kept us at the coffee shop until 8 p.m.
& then the show began in earnest! These well-defined shapes began their dance across the sun's face. Another wave. Then a figure bending down & rising up & a hand reaching out from the other side. Then the clouds conspired to make an orange-gold question mark. Then a bird--a dove!--& more beautiful shapes. The best part of all this, though, was as the trees rose--for we will be astronomically accurate & recognize that we are in fact turning, rather than the sun sinking--we needed to be higher up. Elizabeth whipped the tailgate down & we got up in the truck bed to admire the show from there. The earth continued to turn, as it will, so we climbed up on the roof of the truck--Elizabeth with long legs & alacrity & I with short legs & a short dress & help from Elizabeth--& watched until the trees & clouds covered it completely. As if it were appreciating our appreciating & speaking to us personally. Wifi has been a little weird this week, hence the lag between posts. I went to Best Buy again & stood in their toxic air-conditioning & got some help & got some stuff that turned out to be all wrong when I got it home & had extricated it from its little plastic outerwear & I was hot & dismayed about the stuff & I stuck it in a bag & got in the car to go back & realized I was not in a positive state of mind, so I went around the block & went right back home to meditate & find true inner peace (not so hard, when you're really looking for it & expecting to find it) & watched a dvd (The Secret Behind the Secret) & got all bright & glowy again. Yay me. Suddenly, without warning, I find myself transported to a desert island, my only companion an empty whiskey bottle. No, not empty. Inside are curled pages with a familiar script. Damn you, Bill, I think. Not again! This time, it began at the post office. I had returned from my trip to Virginia, having seen the delightful premiere of Stardust, having reconnected with old friends Charles & Karen, & made new friends of their other old friends. (None of us being particularly old, I might add, except Charles' mother, who was one day shy of 80-something.) On my way back to my habitation, I thought I should perhaps check my box at the P.O., for I was expecting a package from the Amazons, a magical program to turn mere words into moving pictures. I was therefore not surprised to see a small key inside my box, along with several envelopes. I inserted the key into box #27 & found not one but TWO packages. The first, smaller package, was indeed the magical program from the Amazons. 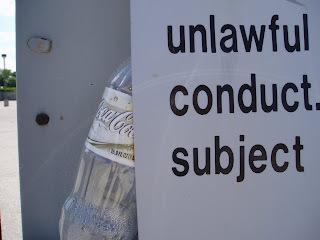 The second--I should have been suspicious, for it was exactly the size to hold a whiskey bottle ensconced in bubble wrap, with several sheets of crumpled heavy paper to further keep it from breaking. But did I suspect? No. I was lulled by my pleasant drive through the mountains & I began at that moment to open the box. When my fingers met the cold glass, I was transported in a whirling vortex to this accursed desert island, & thus you find me. Herein lies the dilemma: I cannot extract the letter without breaking the bottle. What to do, for in the wholeness of that bottle lies my only hope of rescue. If I can write a letter detailing my situation, using a pen from my pocket protector & the pad of paper in my back pocket, kept there for itemizing expenditures & jotting down the odd idea, I can launch my S.O.S. However, I dare not place such a missive in the bottle without first removing Bill's words, which may instruct the reader to disregard whatever is written because this is all a joke, ha ha. I affix the little yellow lump to the tines of the cocktail fork & commence twisting. Yes! I am able to finesse the first page out of the neck of the bottle. I repeat for pages two & three. Bill, if you are the recipient, I beg of you, send help. Or another empty whiskey bottle, that I might post my reply to your letter, for I still have several blank pages left to respond more specifically to what I think you were saying, although some of the words were confusing. (But then they say only Nixon could go to China. What? Also that thing about the bees smoking?--& the caterpillar ranch?) On second thought, leave me a few swallows of whiskey, because I believe the bottle would still float adequately. Oh, & if you can manage, could you also send a raft full of kipper snacks. Until then, I will remain fit. By using my stride as a measure, I shall determine how many laps around a California King is a mile; I pledge at least two miles a day. I shall keep the cocktail fork polished & ready for the kipper snacks, or, should it be necessary, use it defend myself from pirates or the odd shark.